One Step Forward, Inc. is a corporation as defined in the Kentucky Revised statutes, Chapter 273.161 to 273.390 as a nonstock and nonprofit 501-C3 organization. Said organization is organized exclusively for charitable, benevolent, eleemosynary, civic, cultural, educational and/or scientific purposes. Concerned individuals include veterinarians, government officials, equine organizations, university professors in the field of veterinary, horse owners, and local residents. ADDRESSING THE UNWANTED HORSE ISSUES IN EASTERN KENTUCKY. Due to the mountainous terrain of East Kentucky, there is limited pastureland in which to graze horses. Mining reclamation sites are often the only “flat land” in the area and have become excellent grazing areas for a number of animals including, but not limited to elk, deer, turkey, rabbits, song birds, and domesticated animals such as horses and cattle. For a number of years, people in East Kentucky have been in the practice of taking their horses to a reclaimed mining site and allowing them to graze, sometimes with the applied consent of the landowner, often times without consent. The horse owners would periodically check on their horses, provide periodic health care, and remove the horses should they become sick or hurt. In recent years, the horse population being released onto reclaimed mining sites has grown dramatically. This is due to a number of reasons including the decline in the coal industry as a major employer in East Kentucky along with the economy in general not only East Kentucky but across the Commonwealth and surrounding states. Horses have become a costly expense at a time when families find they must cut costs to survive. People can no longer afford to keep their horses so rather than see them starve, they are putting them out to pasture on someone else’s property on reclaimed mining sites, wildlife management areas, and even privately owned residential properties. The lack of options for what to do with a horse that is lame, aged or just no longer wanted in a saturated market where the market value of horses has declined and rescue facilities/horse sanctuaries are operating at capacity. The increasing number of stallions, many of which are mere yearlings, has resulted in an ever growing number of pregnant mares. With no population control, the herds are growing at an alarming rate. Abandoned and unclaimed horses are creating a host of problems. Some of the horses are being malnourished, ill cared for, and create the possibility of spreading disease among themselves and to other animals within the area. These are domesticated animals that have been put out to survive on their own when they are not equipped to do so. This is a picture that is neither appealing nor favorable for those in the area as well as the Commonwealth of Kentucky which prides itself on being the Horse Capital of the World. The majority of these horses reside on reclaimed surface mines. Several of these areas are still bonded and the overgrazing by the horses is costing landowners in maintenance cost as well as thousands of dollars in bond premiums. Reclaimed surface areas can sustain horses during the spring and summer months but there is not enough ground cover and other food sources to sustain the growing herds through the late Fall and Winter months so they leave these areas in search of food. Horses leaving reclaimed surface mine sites are finding their way to residential areas where they destroy property, trample and/or eat landscaping, overgraze lawns, eat wood siding from homes, and lick the paint off and/or chew the plastic or rubber off vehicles. and other structures causing considerable property damage. Horses are also leaving the reclaimed areas at certain times of the year in search of salt/minerals that are found on highways that have been salted for melting away snow and ice. The horses are getting on the roadways and creating safety hazards with traffic including school buses. On numerous occasions, accidents have either occurred or nearly occurred. It is creating a dangerous situation for the horse, the driver and any passengers. Whether real or perceived, property owners allowing horses that are either abandoned or, in some cases, owned by others to remain on their property assume a measure of liability. When the horses leave that property in search of food, minerals, or for other reasons, is the owner of that property then liable for damages the horse creates? As noted earlier, the increasing number of stallions running loose in East Kentucky has created an unmanaged growth in the herds at an alarming rate. Eight of 11 unclaimed horses recently taken up in Knott County were found pregnant. 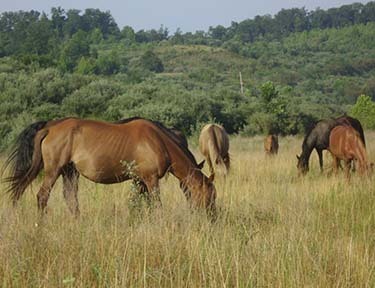 Other herds identified have increasingly revealed higher and higher percentages to be made up of pregnant mares, many of which are still nursing their foals from the previous season. Unchecked, these herds have the potential to double in population every two and a half years. One Step Forward, Inc., PO Box 51153, Bowling Green, KY 42102.